Muing is originally the dative form of mong (hair; figuratively: thick growth of grass, fen, morass, swamp), often used as the nominative. However, on the Discovery map this peak is named Meenteog. This could derive from Mínteog, meaning 'small area of pasture'. There is a townland near Barraduff called Meentoges, seemingly of the same origin. Meenteog is the third highest mountain in the Glenbeigh Horseshoe area and the 102nd highest in Ireland. 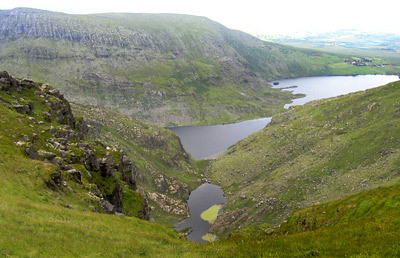 Picture from simon3 : Coomacullen Lough in front of Coomasharn Lake. Picture: Coomacullen Lough in front of Coomasharn Lake. The summit of Meenteog, known locally according to Seán Ó Súilleabháin as Muing, is rough and flat and didn't seem to have a cairn on it. Apart from the various corrie lakes there's also a good view towards Colly mountain 2.3k to the SE, considered by Richard Mersey [The Hills of Cork and Kerry] to be "the finest of the Glenbeigh peaks" (though he didn't say why).